This was a shape I did a couple of years ago and was one of my favorites.. A 6-4 modern fish with quad fin setup. What was unique about this shape was the use of a slope deck to extend volume out to the rails while still maintaining a nice thin rail. Dimensions are: 6’4″ 15” x 20.5” x 15” 2.75”. 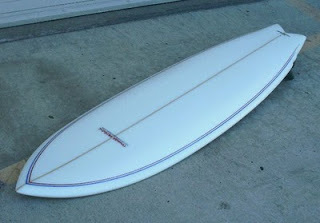 Board featured LokBox quad fins. As shown in the pix, I first ran the Turbo Speed Dialer fins but didn’t like the feel…too “drifty” on hard bottom turns. As a 185lb surfer, I need a little more fin. In a quad setup I like the Taylor Knox fin template in front. It has a 4.68″ depth for extra hold and drive. Then I like to use either the smaller LBXM3.8 80/20 foiled rears or just LB side-bite for the rears. It has a 4oz+4oz deck & 6 oz bottom with clear, sanded-gloss finish to add durability while keeping overall weight low. The double-wishbone pinlines (red&blue) give the board a classic look. Glass work was done by West Coast Glass in Encinitas. The board surfed fast but smooth.